Well caraway is also very popular in Russia, and the tomato sauce is quite close to Adjika (georgian). Wait a minute, so with this one dish we just zigzagged Europe, America and Asia! Isn’t this amazing?.. The original recipe came from Ezard, and called for roasting duck legs, shredding the meat for filling etc. I didn’t have much time or duck legs but i had a freezer full of chicken meaty bones waiting there to be used in stock. So the solution was obvious – roast the chicken, pull the meat off and use it instead of duck. The recipe for filling was promising – hand shredded roasted meat, tiny dice of shiitakes and scallion whites, bound by the paste of raw chicken breast, egg white and heavy cream. Making a filling was a bit time consuming especially shredding the meat into small pieces. But it once again proved the point that a great dim sum can’t be cheap. The dish in the Ezard’s book call for steaming dumplings and serving them in a light asian broth. 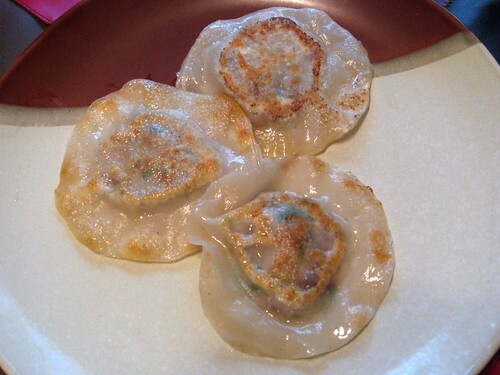 My easy way was to cook them as potstickers serving with kimchi, radishes, watercress and an excellent tofu tamari dip. A perfect end of the week dinner. And the funny thing that when i asked Alex what’s is the filling he said duck and simply couldn’t believe it’s a roasted chicken! 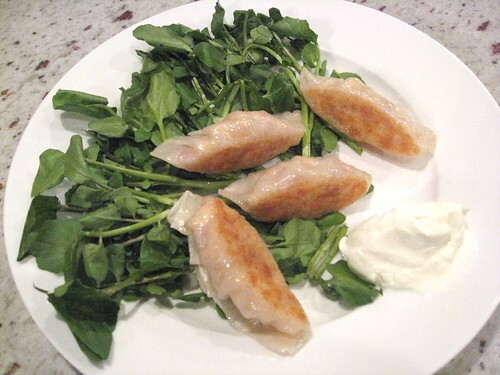 So that was my inspiration for tonight’s dinner – that as well as other traditional russian dumplings, served with crisped pork fat bits, onions browned in the same fat, and sour cream. i rendered a fat from some pancetta, then browned white onion dice in it, mixed with chopped salmon and filled in wonton skins. Cooked then into patstickers but tomorrow i’ll steam them – seems like this will be a better idea for a delicate salmon filling. But other than that – great stuff! 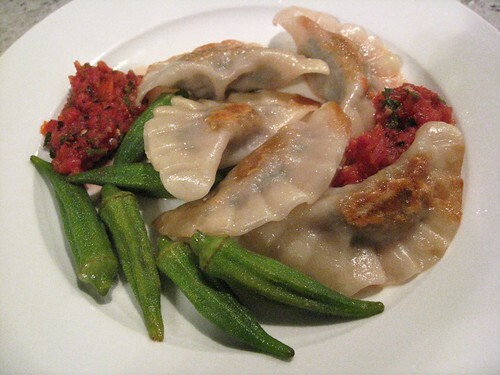 I had a package of wonton skins in the fridge lingering there for couple days because of plans changed. And all of a sudden it occurred to me that i can use the cooked meat as a filling for dumplings: pulled the meat off the bones, shredded, squeezed garlic out of skins (several cloves cooked as part of the stock aromatics) . Added chopped parsley and some chopped kalamata olives and made meat boxes moistened with a bit of the stock. Delicious 9 large dumplings made like from nothing! "Hong Kong chefs are always dreaming up new recipes to make their mark in the world of dim sum" – Martin Yan in Feast.